There simply isn’t enough Korean bbq in my life. With no Korean restaurants in Jackson and the nearest piece of kalbi almost three hours away, my life has developed a kimchee flavored void. Sure, I could make my own bulgogi and kalbi and I have, but there’s something to be said for the pomp and circumstance of Korean bbq in a restaurant. You take your seat, you place your order and the procession begins. 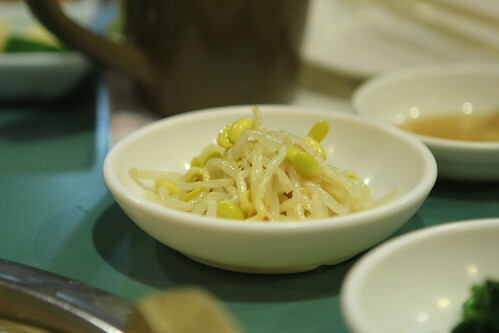 First the banchan arrives and all the favorites are there: bean sprouts, kimchee, Korean radish, etc. Next, if you’re lucky, is the charcoal. 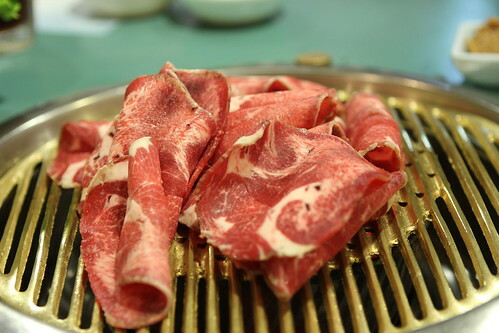 With skilled hands, the grill is lifted and the searing hot pot of charcoal is deposited. Charcoal in place, the grill is reinstalled and the main attraction arrives. Tender strips of ribeye, flanken cut and butterflied short rib, fatty strips of pork belly, and all manner of sea life are just a sampling of what has been doused in a marinade and can be grilled in front of you. Since this scenario is usually missing from my dining options, I do my best to remedy that whenever possible. One of the best places to do that is in Atlanta. 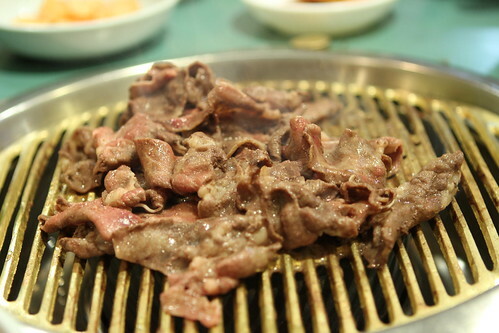 There nestled off the highways of Duluth, Doraville, and Suwanee are a half dozen or so Korean restaurants that specialize in Korean bbq. Looking to expand my Atlanta based bbq experience; I convinced Aaron and Jennifer that we needed to try Hae Woon Dae. I’m not really sure why I picked Hae Woon Dae over the rest. Reading through the local blogs (here, here, & here), it appears that Hae Woon Dae is the old guard of Korean cuisine in Atlanta having been in the city at least since the early 90s. It’s always a gamble with that sort of established restaurant. The food could still be stellar to this day or the more unfortunate and likely scenario, the restaurant survives on legacy, name recognition, or an elderly clientele that is too nostalgic for their own good. 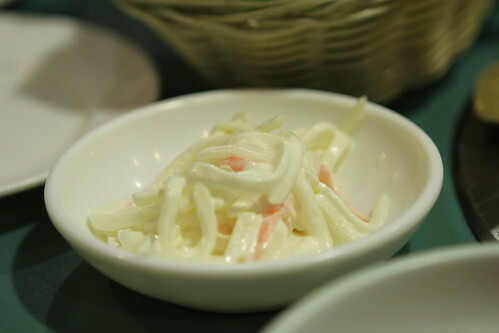 Anyway, the first challenge at Hae Woon Dae was tackling the menu. While trying to decide which grilled items to order, a few appetizers were ordered to get us started. 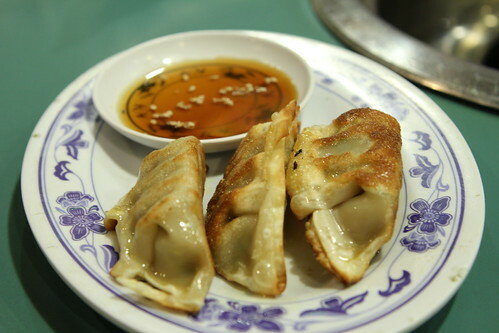 The fried dumplings were the first out of the kitchen. With a clean, simple flavor of pork and scallions and a sweet sesame dipping sauce, these were a welcome start to the meal. 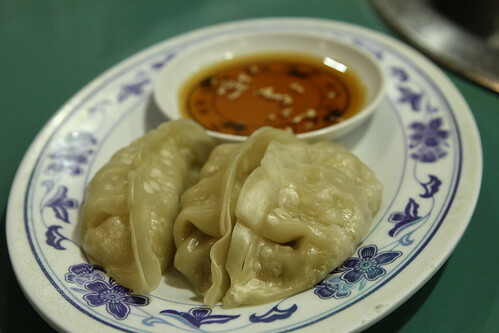 Good or bad, it’s hard to turn down dumplings; fortunately these were a fine example. Simply because we are an indecisive trio, a second order of dumplings arrived at the same time. Steamed instead of fried, the only difference was the steaming seemed to accentuate the thickness of the wrapper. Just as the first order of grilled items was being brought to the table, a bowl of bibimbap arrived. While this bowl was a little hard to mix and share, it was well worth the effort. Each bite was a sesame & gochujang tinged mix of egg, vegetables, and rice. Supposedly there was a little bit of meat in there, but it didn’t really stand out to me. No matter, every bite had me considering hoarding the rest of the bowl for myself. Before I get to the bbq, I feel obligated to show the usual array of banchan. I believe the waitress said these were potatoes. I didn’t really use them. 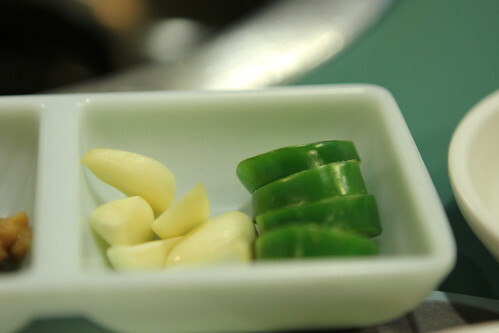 as well as a few cloves of garlic and slices of jalapeno. 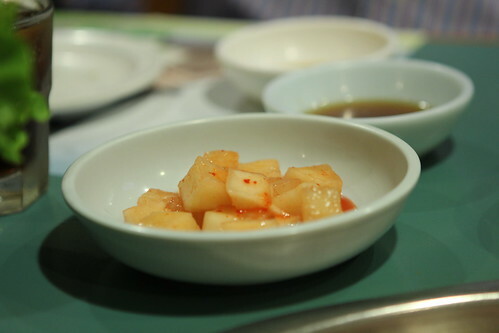 There were a few more bowls in the banchan set, but those pictures didn’t turn out that well. Anyway, an order of thinly sliced tongue was the first meat on the grill. 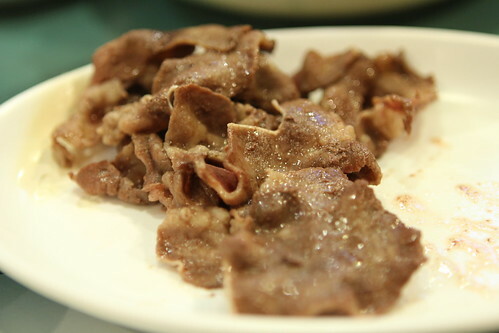 One of the beefiest cuts of the cow, I was expecting these slices to the essence of Korean bbq marinades and beef. That’s a surprisingly small amount of sliced tongue for one order. On its own the tongue was relatively one dimensional, meaty but bland. Based on past Korean bbq experiences, I was expecting a well marinated piece of meat, but when wrapped with a little lettuce, kimchee, and doenjang, it provided a sufficiently beef centric package. 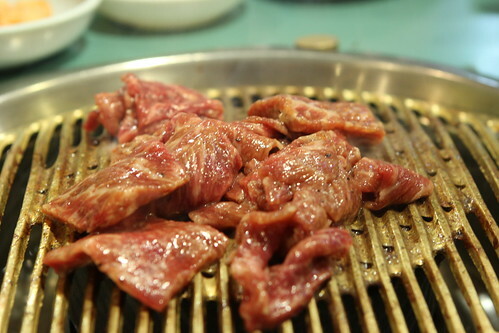 Before the grilled tongue was finished, the butterflied sheets of kalbi were cut into pieces and slapped on the grill. There’s nothing quite like the sight of well-marbled beef on a grill. On its own this short rib was sweet and perfectly tender, but when mixed with a healthy dose of kimchee, bean sprouts, and garlic, it was golden. We originally decided not to have a third grilled meat, but I insisted that a third was necessary. 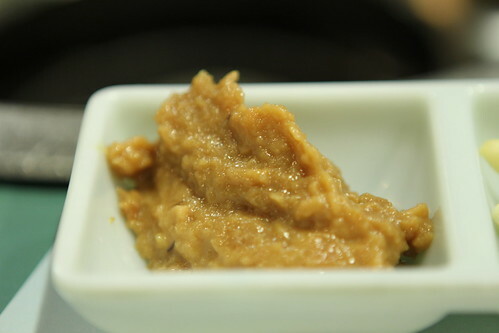 The initial thought was to have the Korean classic, bulgogi, however that was a little too predictable. With a little browbeating assistance from Aaron, Jennifer acquiesced to an order of grilled octopus. After the flavor bomb of grilled short rib, this octopus tasted bland by comparison. 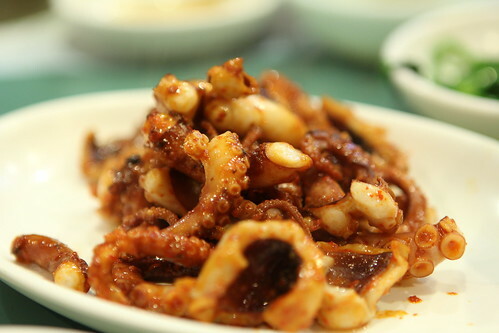 A few minutes and a palate cleansing later, the octopus really began to shine. The meat was nicely charred with a ruddy hue and a peppery taste. It may have been chewy in comparison to the silky kalbi but with the liberal application of doenjang, garlic, kimchee, and the other accoutrements, this octopus was a fine way to end the meal. 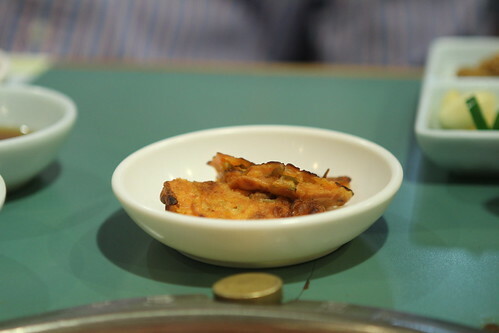 Even though our half dozen or so dishes seemed like a lot of food, we had only scratched the surface of what Hae Woon Dae had to offer. We came to Hae Woon Dae looking for quality Korean bbq and we found it in spades. Sure the tongue was a minor disappointment but the kalbi and octopus more than made up for it. 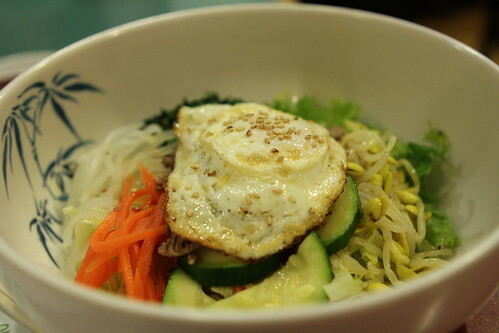 However, if there’s one thing that stood out at Hae Woon Dae, it was the bibimbap. What was ordered on a whim might have been the favorite dish of the meal. 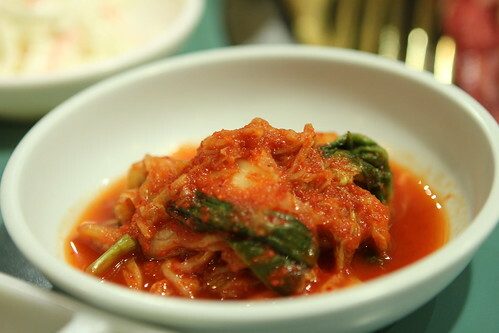 I think that just shows that I need more bibimbap and gochujang in my life or at least another visit to Hae Woon Dae.